There seems to be a modern obsession for enjoying media as far from the source as possible. Slingboxes enable us to watch television from a Web café in Phuket and Orb gives us access to our MP3 files from darkest Siberia. While the ambition of Creative's X-Mod Wireless doesn't stretch to trotting the globe, the ability to enjoy MP3s with the same polish on your living room sound system as on your PC's tinny tweeters is a noble-enough endeavour. The Xmod Wireless comes with two parts. 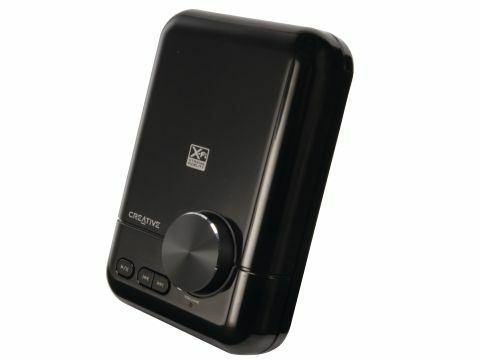 The transmitter acts as a USB soundcard, applying the X-Fi treatment to any sound that passes through it - compressed audio is upscaled to 24-bit and surround sound effects are added. The improvement is most noticeable through headphones. The other half is the receiver, enabling you to listen at the other end of your house. Each comes with a separate remote and there's even an analogue input to accommodate an MP3 player. The X-Fi effect adds a lot to compressed music. Furthermore, the ability to beam that wirelessly to your home entertainment system and still skip tracks, pause and so on is a boon for audiophiles. While raw digital recordings won't be lossless when broadcast, the Xmod wireless is the best option for quality and fidelity when streaming your PC's collection around the house. The X-Fi's two units are both small and attractive too: the shiny outer shell and chunky volume knob shouldn't be an eyesore next to even the most Swedish of stereos. Gripes are few. The price is perhaps a little steep and it'd be great to have a small display listing the track name on the receiver unit to aid the blind browsing. Otherwise, the unique combination of a driverless X-Fi USB soundcard and high-quality streaming device is an excellent way to introduce your PC to your home entertainment kit.